It’s beginning to look a lot like Christmas! 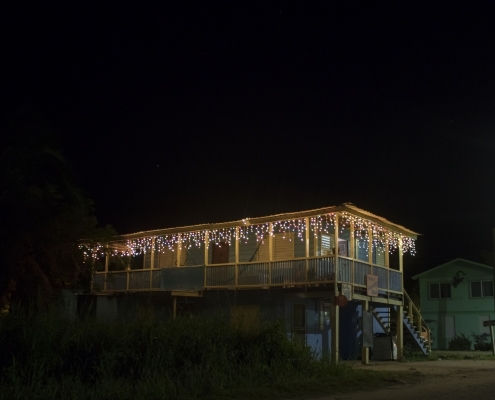 (Or “Krismus,” as it’s spelled in Creole, the language that brings all ethnic groups together in Belize.) 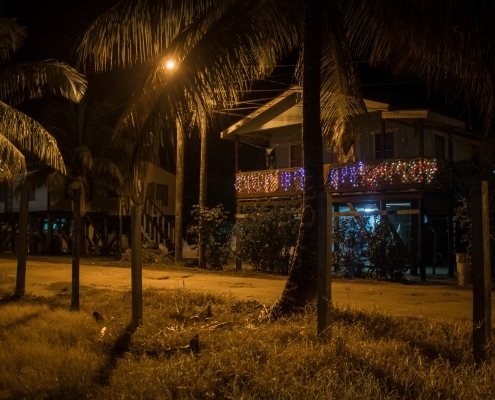 As the holidays draw near, some of the charming houses in Placencia slowly begin to light up, several flanked by the swaying coconut trees. Here are some of our favorites! 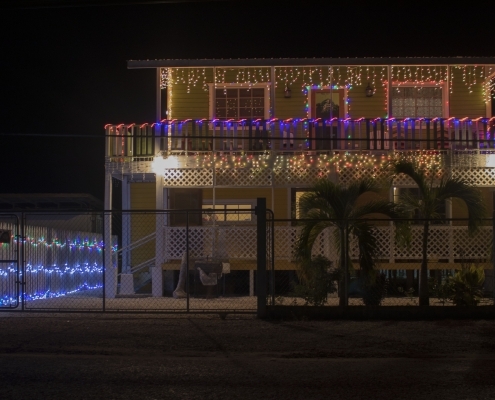 Even though you won’t find these wooden homes on stilts decorated with colorful lights at every turn during your evening walks in the village, make no mistake, the holiday spirit is in full throttle on the Peninsula! On Saturday, December 15, the local tourism industry association holds their 19th Placencia Mistletoe Ball at the popular beach hangout, the Tipsy Tuna. You’ll want to pack your elegant wear in your suitcase to join your tropical and jungle friendly clothing for this community fundraiser. In addition to a traditional Belizean Krismus turkey dinner accompanied by delectable local dessert favorites, you’ll also enjoy a live band playing sweet Caribbean selections. A raffle at this event gives you a chance to win gift certificates that you can use at many wonderful restaurants, tour companies and hotels on the Placencia Peninsula, as well as other hot tourism destinations in Belize. Dinner is served from 7 a.m. to 10 p.m. The dance party, complete with a famous local DJ on a flooring made just for heels, wraps up on the beach at 4 a.m. Get more info from the Placencia Breeze online or on their Facebook page. If you’re a fan of Santa, no worries! He’ll be right here, but probably with his shoes kicked off! Catch the bearded guy fully dressed in a special red buckled suit that can withstand warmer Caribbean temperatures. He’ll be giving out toys to children on Christmas Eve before parading with them and other fantastically dressed village characters in Placencia that evening starting at 6 p.m. at the water tower then ending at the Placencia Municipal Pier. If you’re visiting with kids, you may also want to stop by the Placencia Village basketball court on Saturday, December 22 for the Placencia primary school’s Christmas fair. Be sure to hunt for some homemade traditional black fruit cake – a Christmas delicacy and an inheritance from British traditions in Belize. 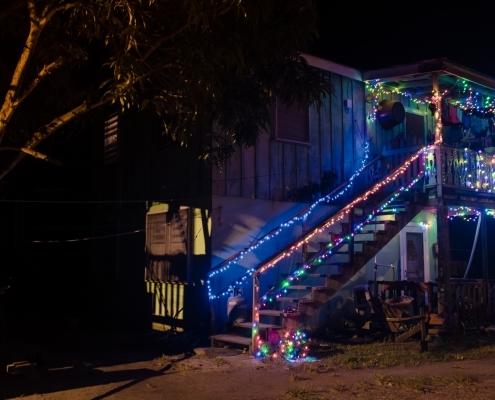 There’s also an annual Christmas boat parade in Placencia, but there’s no real schedule for that event where captains and their loyal crews dress up their boats to channel the holiday spirit with beautiful neon lights. The whimsical boaters will decide when they want to start their show, and we’ll probably learn the date a day before. May we assist you with transportation to Placencia Village to see the Christmas lights or to attend the Mistletoe Ball? Contact our concierge for arrangements. Would you like to support the village toy drive? Just pack a few toys in your luggage, and we’ll be sure they make it into Santa’s hands on Christmas Eve!